Making quick lunch is normally a peaceful time for me. 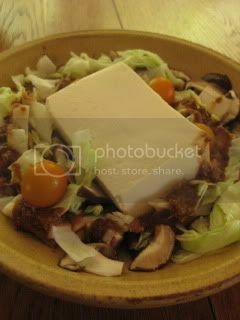 I look inside of the fridge for leftover ingredients which needs to be used soon, then I just come up with a simple donabe dish with these ingredients. 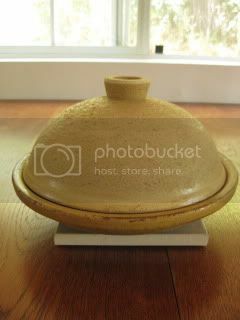 Iga-yaki Steam-roaster donabe, "Tochinsai" is often a very convenient donabe to make a single-serving one pot meal. 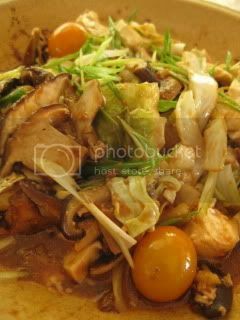 A little drizzle of sesame oil in the bottom, then I just added some sliced garlic, shiitake mushrooms, cabbage, cherry tomatoes, and put a piece of soft tofu in the center. Sauce was a simple mixture of 1.5T each sake and homemade miso. 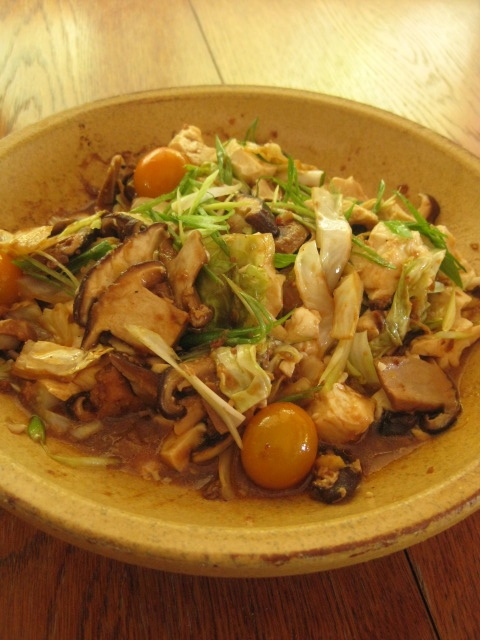 It was poured over the vegetables, then covered with lid and steam-fried over medium-heat gas stove top for about 10 minutes. How easy isn't it?! At the table, I added some homemade chunky la-yu and sliced scallion and mixed everything together with a spoon. That was it! What a deep-flavored balanced meal...and it was unintentionally vegan and low-carb.